We know a lot of our current clients came to us because they were invited by a friend to come try our program out. We want your to “Spread The LOVE” and invite folks to come out Valentine’s Week. What: A Chance for you to “Spread the Love” – Current GYIS clients may invite friends to attend any available boot camp or Cardio Club session with them free of charge. We encourage you to pick up the phone and personally invite them. 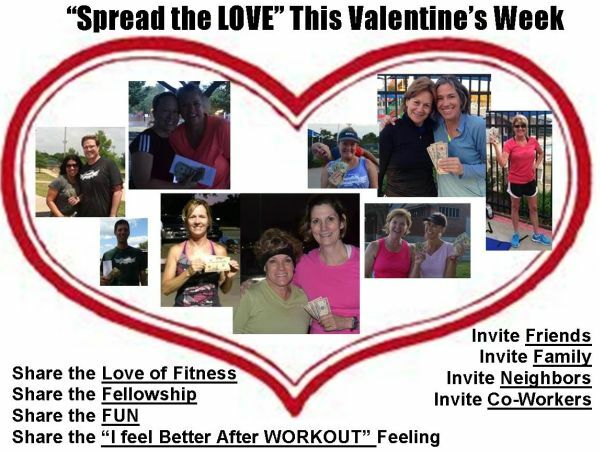 We do ask that they sign up at the website above and that they workout when you workout since the whole idea is to “Spread the LOVE” of health and fitness during Valentine’s Week. Monday Boot Camp – 5:30 a.m., 6:30 a.m., 8:00 a.m., noon, 5:00 p.m. & 6:15 p.m.
Tuesday Cardio Club – 5:30 a.m., 6:30 a.m.
Wednesday Boot Camp – 5:30 a.m., 6:30 a.m., 8:00 a.m., noon, 5:00 p.m. & 6:15 p.m.
Friday Boot Camp – 5:30 a.m., 6:30 a.m., 8:00 a.m., noon, & 5:00 p.m.
Saturday Boot Camp – 7:00 a.m., 8:00 a.m.